"Trade Offers" will allow Steam users to propose inventory item trades to friends, even if they're not online. You've got a problem. You have a ton of useless crapola building up in your Steam inventory that you have absolutely zero use for, and you can never seem to get together with your Steam friends to set up trades because they're not really your friends at all, and they're always out doing stuff without you. Jerks. Or maybe they live in a weird time zone or something. Whatever - it doesn't matter anymore, thanks to the magic of Trade Offers! It works like this: Instead of having to be online at the same time as your prospective trading partner, you can put together both sides of a potential trade - what you want, what you're willing to give - and ship it off to be perused later. 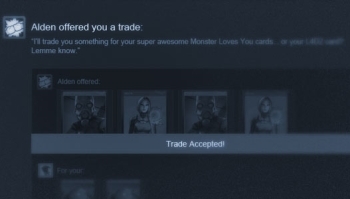 Trade offers can also be sent and received through a web browser, rather than requiring the Steam client. You can send and request more than one item at a time, but may currently only make offers to people in your friend list. Users who have their Steam inventory set to "private" cannot receive trade offers, so if you want to play, you'll have to open up a bit. Trade offers that go unanswered will automatically expire after two weeks, but may be canceled at any time. It may not be the biggest Steam news ever but given the popularity of trading cards and the way some of this bric-a-brac tends to build up (anyone need Half-Life 2 Deathmatch?) it'll probably be a hugely popular feature. Steam trade offers are live now, so if you've got some digital junk you'd like to clear out you can give it a rip right here.